An ancient sink hole in eastern Tennessee holds the clues to an important transitional time in the evolutionary history of snakes. Among the fossilized creatures found there is a new species of snake that lived 5 million years ago. Researchers examined hundreds of dark mineral-stained snake fossils found in the Gray Fossil Site near East Tennessee State University and were surprised to discover vertebrae that don’t match any known species of snake, living or extinct. They named the new genus and species Zilantophis schuberti. Zilantophis bore uniquely broad wing-shaped projections on the sides of its vertebrae. In life, these were likely attachment sites for back muscles. These features are what inspired the name of the new genus, derived from Zilant, a winged serpent in Tatar mythology. 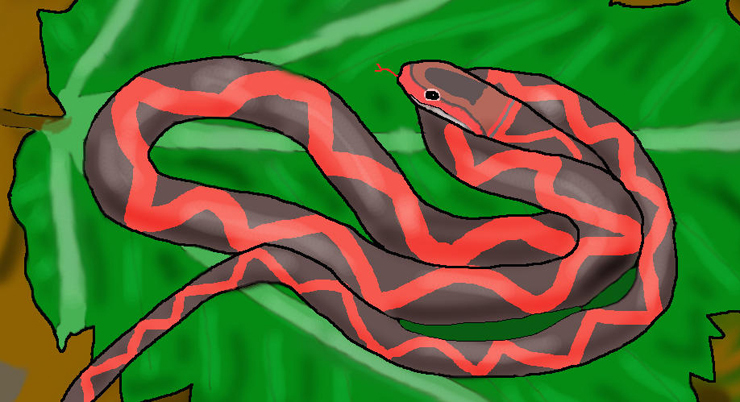 Zilantophis was a small snake, about 12 to 16 inches long. Based on features of its vertebrae, the new species is thought to be most closely related to rat snakes (Pantherophis) and kingsnakes (Lampropeltis), both of which are relatively common in North America today. The Gray Fossil Site is one of the richest fossil localities in the United States, particularly from the Neogene period, which spans from 23 million to 2.58 million years ago. Based on the extinct species found there, researchers estimate it to be between 7 and 4.5 million years old, straddling the boundary between the Miocene (23 to 5.33 million years ago) and Pliocene (5.33 to 2.58 million years ago) epochs. It is one of the only sites of this age in the entire eastern US, making it an important window into a poorly-known part of prehistory. At the time that Zilantophis lived there, the site was a sinkhole surrounded by forest, which attracted a variety of animals. The local fauna included ancient representatives of familiar North American creatures such as bears, beavers, and salamanders. Others were more exotic, including unique species of rhinoceros, alligator, and the site’s famous red panda. “This is a time when the world was moving in the direction of a modern climate and modern fauna,” Jasinski says. The snakes, too, were a mix of familiar and strange. In addition to the new species, there were ancient species of garter snake (Thamnophis), water snake (Nerodia), rat snake (Pantherophis), pine snake (Pituophis), and whip snake (Masticophis), among others. In total, the researchers identified seven different snake genera at the site, many of which are still found in east Tennessee today. This is the first survey of snakes at this fossil site, and it focused specifically on identifying snakes of the family Colubridae, the largest snake family, which includes about two-thirds of all known living snake species. “The Miocene was a time when the snake fauna of North America was undergoing significant changes,” Jasinski says. In earlier times, boas, a group known for their robust vertebrae, were widespread and common across northern ecosystems, but as time went on the boas gradually retreated while colubrids, typically smaller than boas, took over. This shift coincided with continent-wide environmental change, including the replacement of forests with grasslands and the spread of small mammals that may have provided a food supply that fueled the expansion of colubrids. The discovery and continuing investigations at the site help fill in details about the rich biodiversity of an ancient ecosystem as it underwent a shift in climate—details that can inform our understanding of the future as well. The findings appear in the Journal of Herpetology. The National Science Foundation, Office of Research and Sponsored Programs at East Tennessee State University, and the Don Sundquist Center of Excellence in Paleontology funded the work.